Teuven-Dorp 60, Teuven, 3793, Belgium. Please don't hesitate to call or e-mail us for further information. A huge selection of beer, with 12 on tap. Capacity: summer time; seating for 220 & wintertime; seating for 100. Nature walks, with or without guide. Antique tractor & wagon tours. Trappist beer tasting in our inn or a Trappist beer tasting tour in natural surroundings. Farmers golf with a 30 hectare playing field. Various arrangements with the possibility of a visit to an old-fashioned apple treacle farm, brewery, winery, trout farm, bee-keeper or ceramic pottery. Wooden games from around the world. so long as we are informed in time. Teuven rises out of the most north-western part of the old Dutch Limburg. In 1288 this region came into the possession of the dukes of Brabant who later passed it onto the dukes of Burgundy. It then came under the rule of the king of Spain and finally into the hands of the Austrian Habsburgs who gained power of the region during the French Revolution. The present Teuven is formed from three old residential areas: Nurop in the northwest, Teuven in the middle and Sinnich in the southeast. Nurop is an old farmer’s settlement, Teuven a residential area around the church and castle, Sinnich the living quarters around an abbey. Herberg Moeder de Gans is positioned at the old village square of Teuven, in view of the neo-gothic Saint Peters church, the old town hall built in the 18th century and the old schoolhouse protected by century old trees. Moeder de Gans has been established in a traditional farm from the 18th century. The living house is the oldest part of this farm complex, dating back to 1740. The old open hearth dates from the beginning of the 18th century. Of the many sheds and stalls, built in a variety of styles, the inn stands out most impressively. This stall was built at the end of the 19th century as a horse stable. In the interior, you’ll find frequent use of bluestone, including the original horses drinking trough carved out of one solid piece of stone, which now stands by the bar. A large open hearth in the inn has been built on an authentic millstone, originating from an old grain mill from the area. A glass conservatory has been built around the original well. We have recently renovated this sunroom in the old style of cobwork. You can now stand above the well on a thick glass plate, looking down 8 mtrs to the grond water. We have hand built an oak table around the well... accentuating this feature. In the courtyard you’ll find the ‘watchdog’ kennel built into the old cow stable, and the original standing shack and drop toilet. Immediately behind the restaurant is a natural spring flowing year long with fresh drinking water, of course the central spot the town was founded on. We also have our own natural spring in the bottom field of our farmland. Perhaps the biggest attraction is the source flowing through our magnificent copper bar taps, offering 12 Belgium beers from the barrel. Further more, you can choose from more than 100 sorts of bottled beers, each presented with its own glass. The restaurant offers regional specialties and works with many local biological products. Moeder de Gans is both cosy in the winter time and relaxed during the warmer months, on the various sunny and secluded terraces or enjoying a quiet moment on our 3 hectare nature area. and hope that you enjoy your visit. Proudly we present to you our "drùpke" ~ sloe gin, which has been ripened in oak barrels. When we purchased the premises in 1993, Mrs. Houben, the previous resident, brought our attention to various bottles of homemade sloe gin that she had laying in the cellar. Local folk used to prepare a batch each year, by topping up a 1/3 drunk bottle of gin with the sloe plum, stopping it with cork and leaving it to age for one year before drinking. and amongst the street hedges lining the streets. 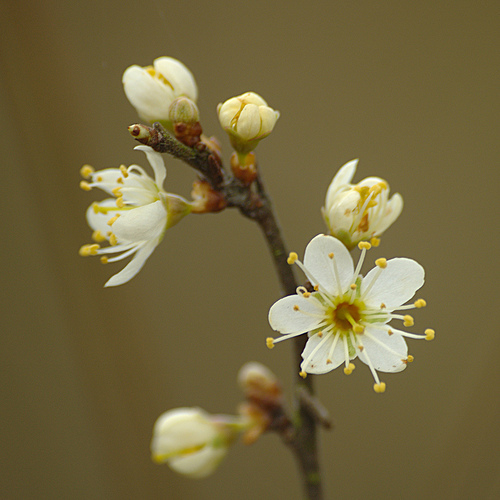 It blossoms very early in the year with delicate white flowers, which attracts scores of insects to the first spring food. In the autumn, the bush bears round, blue and extremely sour (sleeuwe) plums, the "sjlieëkreek". In the local dialect they also use the expression "sjlieë täng" to describe the fruit: the feeling on the teeth that you get after eating such foods as a sour apple, rhubarb..... or sour plums. 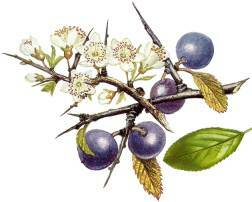 The sloe plum is picked after the first frost has taken place. This mellows the taste of the fresh plum. The sourness is no longer present once the liqueur has been made. Our sloe gin ("sleedoornjenever") is in fact rather sweet, has a delicious dark red colour and an alcohol percentage of around 30%. After following the traditional recipe from the region, and allowing the sloe gin to mature for a period in our own oak barrel, which you will find right of the main entrance in our Inn, the results are extremely soft and full flavoured, suitable as an aperitif or digestive. We are proud to serve you this authentic homemade product following traditional methods. Our 'sleedoornjenever' is available by the glass. "To your health! ", de Gansjes. All of the dishes that we offer are homemade and consist mostly of traditional products from farmers and merchants from the region. During the preparation of our meals, we make use of a special vacuum technique. This technique stabilizes and maximizes the quality of products preserving the special aroma, taste, composition and nutritional value. This means that the natural tastes of the products are not lost and therefore allows us to limit or completely leave out the addition of taste intensifiers (salt included) and unnatural additives. By vacuuming the product to 99% in special packing and creating under pressure, the boil point is dramatically lowered when cooking. The biggest advantage of this is that we may reach the end result of food preparation through lower temperatures than in traditional cooking processes. Everybody is aware that forced temperatures in preparation methods needlessly damage the product, leaving little of the original nutritional value as a consequence. From the moment that our products come in, till the moment of serving, we follow this vacuum technique, eliminating contact with the open air and therefore guaranteeing maximum hygiene. The hygiene standards that we follow conform to the European HACCP system. Wishing you an enjoyable meal. ~ Details of payment: We only accept cash payment for all of our services. It is not possible to pay with any credit card or EFTPOS. ~ Separate accounts per person are not possible. ~ Since 2007 it is forbidden to smoke inside the restuarant. You may enjoy your smoke on the terrace or in our special smoking hut. ~ It is not acceptable to consume self brought food or drinks! ~ For your and our safety, our grounds are monitored by camera’s. ~ We kindly remind you, as parent or accompanying grown up, that you are responsible for the children’s behavior and any damage they may cause to Moeder de Gans. ~ Please disconnect the sound signal from your mobile phone ensuring for all guests a relaxing time away from the hustle and bustle of hectic daily life. Should your phone ring, we ask you kindly to take the call in the hall or outside in the courtyard. ~ Quiet dogs are most welcome, on a lead. ~ Concerning the welfare of our pets, we inform you that it is forbidden to feed any of animals that you find at Moeder de Gans. Trappist beers are brewed by monks, members of the Cistercian order. Trappist beers are widely praised for their non-commercial approach, craftsmanship, boldness and deep flavor. Trappist recipes have remained authentically unaltered for centuries, whereas the more commercial abbey beers evolve with the taste of modern consumers. So, if you would like to enjoy a beer as it would have been served many hundreds of years ago, a Trappist beer is the way to go! Such a large selection of beers demands from us a special kind of attention. Each beer is served in its own particular glass. Just as one glass must be polished dry, the other should be served wet. Our Trappist beers stand in a separate fridge, so as to be served at a particular temperature, whereas other special beers must be collected from the cellar. Please keep in mind that this means it may take us a little longer to serve you your order. Rosé wine from 100% Cabernet Sauvignon, from Langue d’Oc, France. Salmon rose in colour with an inviting bouquet of ripe red fruit and a suggestion of herbs. It shows a subtle balance between soft fruity flavours and refreshing crispness. Especially nice beside: Salads, headcheese, vegetarian dishes, salmon, ham and goulash. A late harvest Kanzlerrebe from Windesheim, the Nahe region in Germany. A lovely bouquet of roses, melon and passion fruit followed by a deep, pure sensation led by pronounced dried apricots in the taste. A beautifully balanced wine... truly everyone’s friend! Especially nice beside: Apple pie, Val-Dieu salad, cheese plateau’s and all dishes made with or served with apple syrup such as the beef stew, rabbit quarters, meatballs and black pudding. A fresh, fruity 100% Pinot Grigio, from the Mendoza region, Argentina. A pale, clear, lemon colour with the scent of citrus zest and sun ripened tropical fruit. The flavours are beautifully balanced with characters of citrus fruit and ripe yellow stone fruit. Especially nice beside: Trout, goats cheese and the full spiced Moeder de Gans salad. A full bodied 100% Cabernet Sauvignon, from the Mendoza region, Argentina. A sensual ruby red wine with a deep purple tinge and inviting aroma’s of juicy black fruit direct from the forest floor. In the flavour delicious accents of ripe forest fruit, blackcurrant and cedar wood supported by beautifully balanced tannins and a fine intensity. Especially nice beside: Beef stew, rabbit quarters, smoked trout, black pudding and dishes with strong cheeses such as the Moeder de Gans salad and cheese plateau’s. "Bodega Tamari" means to do everything with Passion in the language of the local ingenious folk. Passion is, indeed, reflected in the science and craftsmanship of the wine making process. 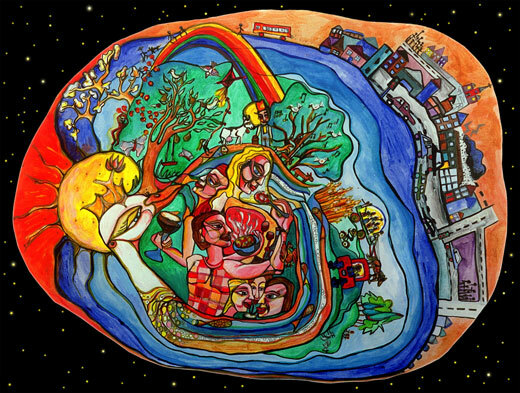 Here, sun, soil, and water are combined with love and energy. At 1200 meters, this well respected winery creates with the heart, and still with the hands, outstanding wines with the flavour of the mountains and the sky! Domaine aumonnier, Les Chardons ( Bio) : France, Loire, Sauvignon Blanc. Château La Reze Gravade, Moulin des Nonnes ( Bio) : France, Minervois, Rousane, Grenache Blanc and Muscat. Mas de Janiny Les Soeurs ( Bio) : Rousillon France, Syrah. Domaine Jean Bousquet ( Bio) : Argentina, Malbec. La Fortunas Ventura ( Fairtrade) : Chili, carmenere. Domaine des Allants ( Bio) : France, Bordeaux, Merlot, Cabernet Sauvignon and Cabernet Franc. Pure, mineral wine from the region. The vineyard from Pietershof wine Estate is situated on a south facing slope in Crindael, between Teuven and Sint Martensvoeren. It has a rocky marlstone rich soil composition; 70 million years ago this land sat under the sea. Many fossils are found here; silent witnesses of the impressive changes in mother nature. The squid was for this reason chosen as the logo on the etiquette. Pietershof is a small artesian family winery, where the grapes are still picked by hand. A sparkling wine from Riesling en Pinot Gris, with gorgeous fruit expressions, particularly pronounced lychee, and with a touch of fresh almond. Crowned best sparkling wine from Belgium. A rounded white wine from 70% Pinot Blanc with a trace of banana and grapefruit in the palette and a soft, fresh acidity in the finish. The 2010 vintage won last year the title as best white wine from Belgium. 90% Chardonnay and 10% Pinot Gris: an elegant, soft touch and a smooth flavour makes this an ideal partner to enjoy with several salades. A dry, light red wine from 50% Pinot Gris and 50% Pinot Noir. It has a fresh character of red forest fruits. With pride, we offer you these quality wines from the region. Bite size blocks of cheese and metwurst. Bite size portions of our local cheeses. Bite size selection of local cheeses and meat products. with thinly sliced raw farmer's ham. pâté, farmer's cured ham, metwurst, brawn and meatloaf. Four kinds of cheese from the region. Aged farmer's ham, metwurst, brawn, pâté and meatloaf. Locally made pâté served with onion chutney. Brawn served with a locally made mustard. For the real cheese lovers! A whole block of soft, smelly cheese produced in the nearby village. Blood worst pan-fried with apple wedges in farmer's butter. Omelette served with crispy bacon. wood-oven bread and i local apple treacle. An exotically spiced mix of eggplant, pumkin, zuchini, chickpeas and red onion served warm on a bed of mixed salad with avocado, croutons and matured cheese. Moeder de Gans salad with bacon. Mixed salad with crispy bacon and a raspberry dressing. A soft cheese from the neighbouring abbey Val-Dieu (similar to brie), served warm on a bed of mixed salad with a dressing made from walnut oil. Fresh young goats cheese from a local farm, served on a bed of mixed salad with a raspberry dressing. Limburg trout fillet on a bed of mixed salad, served with a dill dressing. Lightly smoked salmon, thinly sliced, served on a bed of mixed salad with a dill dressing. The above dishes are all served with wood-oven bread and butter. The bread that we serve you comes from a traditional baker. The flour, consisting of ecological bread grain types, has been ground by a water powered grain mill. The wood oven bread dough rises with only natural additives, as the baker uses exclusively sourdough in his process. As the dough is left to rise for a few hours, the baker preheats the completely conventional oven with beech branches. Previously the dough was kneaded with the feet (!!! ), these days the baker does this with a dough machine, being the only mechanical process he now applies to the production of the wood oven bread. Considering this authentic manner of bread preparation, we are proud to serve you this unique product. Pâté made according to the old-fashioned craft, served with Monegaskische sauce, a chutney made from onions. Mixed salad with a crispy bacon and a raspberry dressing. Home-cured (½ year old) Voeren ham, thinly sliced, served with honey melon. Fresh young goat's cheese from a local farm, served on a bed of mixed salad with a raspberry dressing. All these dishes are all served with wood oven bread and butter. ~ Trout in farmer's butter. ~ Trout in farmer's butter with slivered almonds. ~ Smoked trout with a horseradish sauce. Our trout are served whole and are prepared in the oven. Salmon fillet served with a fine river crayfish sauce and fresh herbs. Leg of rabbit slow-cooked with prunes and apple treacle. Homemade meatballs following an old Teuven recipe with a sauce made from chicory, onion, beer and apple treacle. Beef stew prepared with onion, fresh champignons, apple treacle and a dark beer. Goulash prepared with beef, tomatoes, capsicum, onion and fresh champignons. Ham served with a mild mustard sauce. served over a pastry shell. Our chef regularly prepares two special offers allowing some variation from the set menu card. This includes a special vegetarian meal. Ask your waiter/waitress for a translation. Warme chocolate tart with a melted center served with Stracciatella ice-cream and whipped cream. Fresh strawberries served with vanilla ice cream and whipped cream. Artisanal sloe ice-cream with homemade sloe jelly and whipped cream. A selection of cheeses from the region, served with apple treacle and wood-oven bread. Our ice is distinguished by 100% natural products. The typical full taste of the ice is guaranteed by the use of 40% fresh cream, full milk and eggs, direct from the farmer. Only the best ingredients are used to guarantee constant quality: Bourbon vanilla from Madagaskar, Belgian Callebaut chocolate, real speculaas cookies... There are no artificial flavours or additives. Create your own coupe from your choice of three balls of ice-cream and a topping. Served with whipped cream, nuts and a cookie. Vanilla, Pistachio, Strawberry, Stracciatella, Walnut, Sloe, Speculaas, Yoghurt, Mokka, Belgian pure Chocolate, White Chocolade, Rum & Raisin and Tirimasu. Strawberry, Chocolate, Caramel, Raspberry, Passion fruit and Egg nog. Vanilla and strawberry ice-cream topped with strawberry sauce and whipped cream. Available for 15 or more people. "A VIEW OF THE VOER REGION"
Arrive at Mother Goose Inn for coffee or tea and homemade applepie. Introduction to the region followed by a short informative walk through the village and forrest of Teuven led by an expert guide. Choice of Mother Goose salad or crispy bacon salad in Mother Goose Inn. Nature walk through the Voer region led by an expert guide. Should you have reservered a bus for your day out it is possible to do a bus tour instead of a walking tour at this point. Think on the correct walking shoes! Aperitief: Peach cider from the region. A buffet consisting of regional products selected from local farms. It is possible to order a warm buffet suppliment. Refer to the Voerens buffet in our menu. keeping in mind a minimum participation of 15 people. Enjoy lunch at Mother Goose Inn with a Moeder de Gans salad or crispy bacon salad. (1) 7 km: An easy walk through the nature along dirt tracks and some sealed roads. Suitable for young and old, pushers and carts. Available in Dutch and English. Educative walk based on a goose board game, aimed at informing you about the nature you pass through on your walk. On return to Moeder de Gans, around 16:00 you have the opportunity to play the board game utilizing the information you gained. (3) 14 km: An extensive walk through the neighbouring nature fit for the more advanced hiker! Available in Dutch and English. Think on the correct shoes for all our walking routes! Trappist beer tasting at Mother Goose Inn. A buffet consisting of regional products selected from local farms. Smoked trout fillet with a dill sauce, half a dozen local cheeses, an assortment of cold meats including slices of cold grilled ham, pâté, meatloaf, metwurst and our famous dried ham. This is accompanied by various sorts of wood-oven bread, sauces and dips, home-made potato, pasta and fruit salad, as well as other fresh garden salads. Tour through Teuven and surroundings on an antique tractor pulled wagon with a fixed price for a maximum of 3 hours. Average speed 5 km p/h. Wagon for maximum 15 pers. + Wagon for 16 - 25 pers. Duration: 1½ - 2 hours. No dogs allowed! On walking distance from Moeder de Gans. Duration: 2½ hours. Free poncho in bad weather! Visit the biological farm. Duration: 1 hour. Beer tasting in the nature (+/- 4 km). After being greeted in the inn by our friendly and expert guide, you begin with an abbey beer, a short explanation over the region and an introduction to the world of beer. You then step out for a short walk along the typically beautiful Voeren landscape, with two pauses in the middle of the nature, where your guide will tempt you with the real beer, two Trappist beers, accompanied by information regarding the natural surroundings, more stories regarding the culture of beer, insider knowledge of the three beers chosen for your tasting, and a little finger food. It’s a relaxed walk back to the inn giving you time to digest the information and enjoy the warm qualities of the beer combined with fresh air. Duration approximately 3 hours. A tasting of Trappist and abbey beer at Mother Goose Inn, lead by our friendly and knowledgeable guide. Duration approximately 1½ hours. A guided tour of a local, traditional brewery together with a beer tasting. Duration: 1½ hours, last appointment at 19:00. Enjoy a tour of the abbey with a guide to explain monastery life and the history of the Cistercian Order. Duration: 1 hour, last appointment at 16:00. Duration: 2½ hours, last appointment at 16:00. Visit a bee keeper to learn the life of a bee. You can enjoy a sandwich with honey plus tea or coffee with your visit. Duration approximately 1½ hours. Enjoy the opportunity to create your own ceramic pot and sculpture. Duration: 2 hours. Max. 30 pers. A guided tour at the snail nursery Sint Heribertus in Remerdaal explains the life of a snail and how to farm them! On site tasting also available. Duration: 1 to 1½ hours. Rope course: High above the ground, try to keep your balance as you follow an obstacle rope course over rivers and through the forest. Of course you are secured with a harness for your safety! Flying fox: Feel like Tarzan in the Jungle as you swing through the trees to the ground below! Climbing wall: The mountain goats amongst you will be happy to find a climbing wall between the trees. Bow and arrow: Aim sharp and shoot the apple from the head like a real Robin Hood! Speleobox: Try to find your way out of a maze built into a 20 sq. mtr wooden box. Book each element per hour or combine programmes. Duration: 2 - 4 hours, depending on arrangement and size of group. South Limburg and the Voer region are famous for their "vlaai" made with seasonal fruit. During this workshop you will learn how to bake a delicious Limburgs "vlaai" in an authentic wood oven, following a traditional regional recipe. Duration: 2,5 hrs. Price includes taking home your own baked pie. The chance to visit an apple syrup farm in Hombourg. With the help of a film (30 mins.) you discover how this regional speciality is produced. Established in the commandery of St. Pieters-Voeren. Guided tour, by reservation, from 10:00 o’clock. Within the tour you will be able to visit the fish farm on the mountain, ca. 1 km from the castle. From Teuven, you make a fantastic mountain bike tour along many characteristic spots of this region. You ride a bicycle through picturesque towns, but also through the untouched nature. Our guide will give instruction on the best way to handle your bike in the mountain. Before setting out you can indicate to your guide which kind of tour your group is geared for, be it sports-loving or a more recreational tour, based mountain bike experience and fitness level. Duration: 2 - 3 hours. Guided walking or bus (should you have a bus arranged for your day out) tours through the Voerstreek designed in collaboration with various officially recognized guides from the VVV tourist bureau. These guides are qualified to inform you of all the attractions to this unique area. Available for 2 hours, 3 hours or a day arrangement. 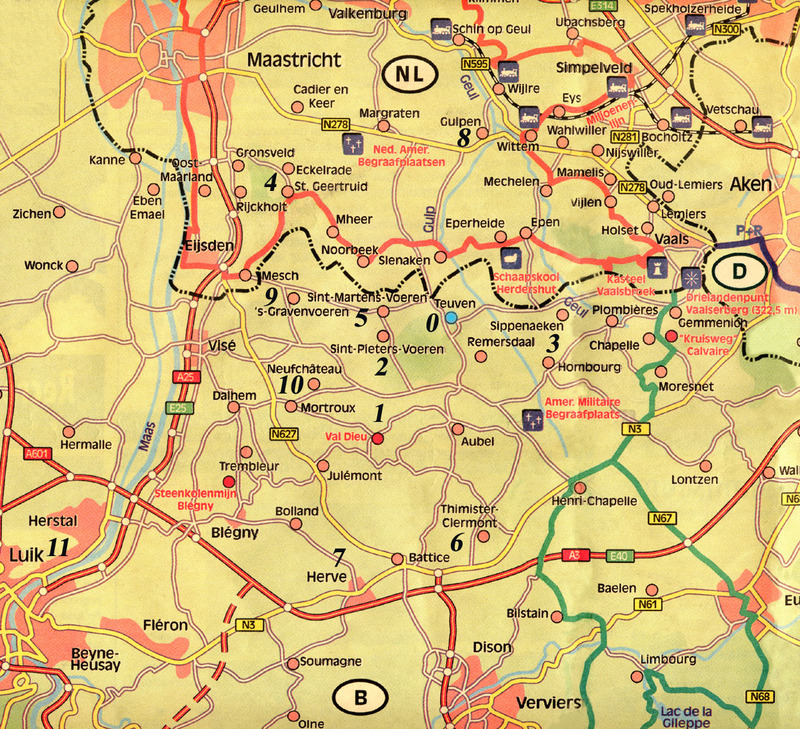 Map of the district: Detailed map of the Voeren district including a regional map showing Maastricht, Aken and Liege. 0. Mother Goose Inn, Teuven. 2. Trout farm, St. Pieters-Voeren. 3. Goat cheese farm, Hombourg. 4. Wood-oven bakery, St. Geertruid. 6. Municipal walking routes, Clermont. 7. Smelly cheese farm, Herve. 9. Black pudding butcher, ‘s-Gravenvoeren. available to the value of any sum you desire. ~ Various postcards from the region. Please send us an email or give us a call... We would love to suggest the possibilities there are for you to stay in the area. 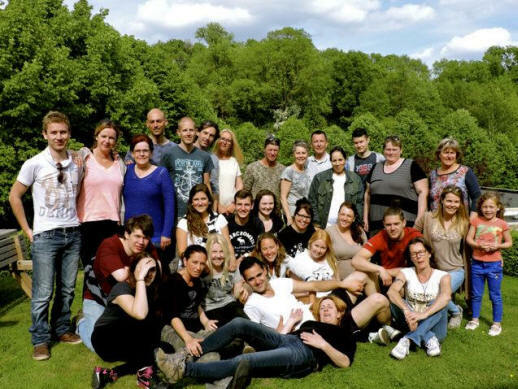 From camping situations to high class romantic get-aways... Voeren is a wonderful place to visit. Open fires welcome you in the winter, butterflies and bumble bees in the plenty during summer and the birds cheerfully singing all year round. We highly reccomend you make a reservation ensuring an enjoyable stay at Mother Goose, especially during the weekend and public holidays. Naturally we only make reservations for parties interested in a meal, and are unable to reserve a table on the terrace! We direct you to our price information link for an insight on our prices (in Dutch). Alternatively, you can contact us via telephone or email to discuss your arrangement of choice.